Dog attacks are on the rise in America. One report from an organization that tracks dog attacks and other dog-related injuries noted that over 30 percent of the money paid out through homeowner’s claims in 2017 was due to dog bites. While large dogs are generally responsible for these attacks, any dog can be dangerous when it is running loose or is improperly socialized. If you have experienced a dog attack and are unsure how to proceed with collecting a personal injury settlement, there are a few steps you can take to ensure your rights are protected. If the owner is present during the attack, collect his or her contact information right away. Ask for proof that the dog is vaccinated and let the owner know about what kinds of injuries you have sustained. If the owner is not present, have someone follow the animal at a safe distance to see if it returns to its home. Look for an open gate or a broken tie that may have allowed the dog to escape. Taking photos of your injuries before they are treated can help legal experts understand and take note of their severity. If friends are with you during the attack, ask them to take photos of the dog as well. If the owner of the dog denies that it was his or her dog that caused the attack, photo documentation of a bloody muzzle can go a long way when it comes to proving your case later on. Even one bite on the leg or ankle might cause you medical problems later, so it is important to file a police report that same day. If the attack required you to be transported to a hospital, ask a friend or family member to call the police so they can come and take a statement from you as soon as possible. Try to give specific details about the attack and ask for copies of the report once it is processed. Some dog breeds, such as pit bulls and German Shepherds, were bred to guard and fight and may be more predisposed to attack people or other animals they perceive as a threat. Whether some breeds are more naturally dangerous than others is a source of constant debate among pet owners, but it is a fact that these dogs do typically cause more injuries than other breeds. If you are attacked, try to identify the breed of dog responsible, as data regarding past attacks by that type of dog may support your legal case later. 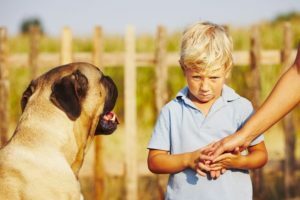 Seeking a settlement after a dog bite can be challenging, especially if the dog’s owner denies responsibility. Contacting a law office that specializes in personal injury cases, such as Shook & Stone, can give you peace of mind when it comes to resolving your case and protecting your legal rights, and some attorneys will come to the hospital to meet with you if your injuries require extensive care. Experiencing a dog attack can be traumatic and cause serious injury. Understanding your legal rights in the aftermath can give you peace of mind and help you recover whatever losses you endured due to the negligence of a pet owner.